Chris Christenson, one of the best board shapers, has collaborated with us for SRF CTY this FNO, creating limited edition surfboards available for sale starting this Thursday. We asked him on his thoughts on foam dust, Marc Jacobs, the convergence of fashion and surf, and other very serious issues. Do you think breathing foam dust makes you mad, ie crazy mad? Foam dust is great! Better than cocaine, looks the same and it's free. Keeps you skinny too just like coke. When traveling, do you prefer window or aisle? Usually I drink a few beers before I get on the plane so I can sleep. Unfortunately, I have the same size bladder as a squirrel so I have to constantly use the bathroom so I prefer an aisle. Chris waiting to board the NYC L train. So many puns to be made. Image from his blog. Who is your muse? Music and travel are my muse. From Ludivico Einaudi and Radiohead to Indonesia and Vegas. 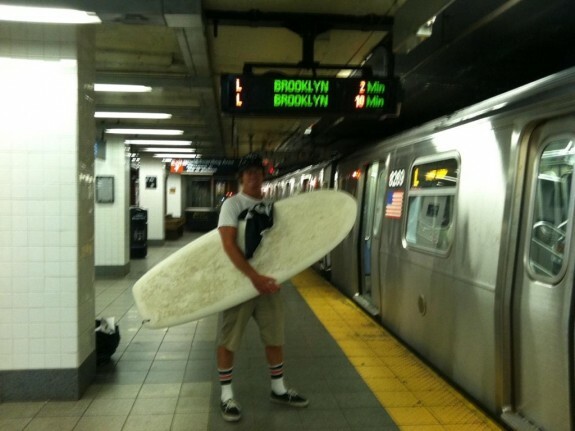 Can you comment on the convergence of fashion, motorcycles, surfing and golf? Fashion, motorcycles, and surfing go hand and hand benefitting form each other. Self expression, exploration, risk, aesthetic, speed, style, individuality, and freedom. Golf brings me back to ground zero reminding me that I can still be a kook. Hard or soft cheese and why? Hard cheese, farts are way less risky. Do you think that Marc Jacobs could do a couture line and take over at Dior? Who is Marc Jacobs?